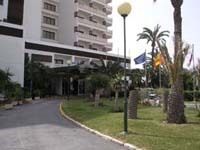 Pictures and review of La Zenia Hotel, located on the Costa Blanca, Spain. La Zenia Hotel - The ever popular La Zenia Hotel is in an unbeatable location right on the seafront of the 2 La Zenia beaches. Just 5 kilometres from the busy town of Torrevieja, close to all the Orihuela Costa beaches and within easy reach of at least a dozen golf courses, the La Zenia Hotel is the prefect spot for your stay in the area. This modern and comfortable hotel is particularly suitable for families and has 2 swimming pools, sun terrace, garden areas, children's playground, wellness centre, tennis court and a varied sports and entertainment programme. Its 220 comfortable rooms have air-con, sea views, full bathroom, TV, safe, mini-bar and internet connection. La Zenia - Situated in a district known as the Orihuela Costa, La Zenia is a popular and desirable holiday location within the Costa Blanca region, it has fine sandy beaches and a good choice of facilities. Access La Zenia from the N332 or the AP-7 motorway (junction marked La Zenia), time to Murcia airport 20 minutes, time to Alicante airport 45 minutes.